A trick to figuring out the products of the Ozonolysis Reduction reactions is to simply squeeze two oxygens at the center of the starting alkene and that separates out your two products. We drew out the products facing each other to more easily visualize this. A trick to figuring out the products of the Ozonolysis Oxidation reactions is similar to the trick of Ozonolysis Reduction described above. 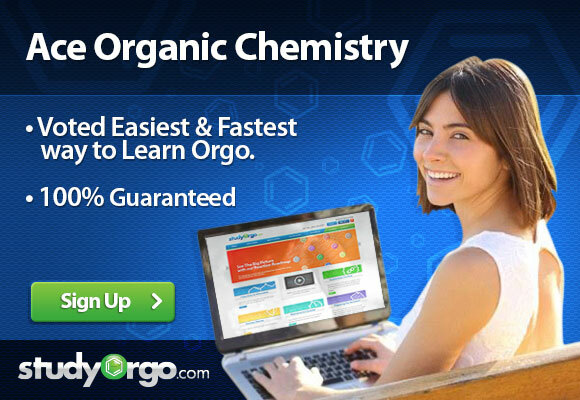 Simply squeeze two oxygens at the center of the starting alkene and that separates out your two products. However, you must also add an oxygen before the hydrogen in any resulting aldehyde to make it a carboxylic acid. We drew out the products facing each other to more easily visualize this. Key Tip: In general, ozonolysis reactions have two stages of adding reactants. The first is to add ozone (O3). The second determines whether the reaction will proceed as reduction or oxidation. A reactant such as (CH3)2S will promote reduction, while a reactant such as H2O2 orwarm, concentrated KMnO4 will promote oxidation. Beware! Ozonolysis problems can be challenging at times, and as such professors will test these problems in a variety of different ways. One classic way of testing ozonolysis is to provide the two products and ask the student to determine which starting alkene underwent ozonolysis to produce the given products. This is why the StudyOrgo.com unique reaction flashcard method is so valuable. We recommend that in addition to learning the reaction by revealing the first and second windows then determining the last window, that students reveal the middle and last windows and try to determine the first. This can be practiced by creating custom quizes in the unique StudyOrgo.com Quiz Mode. Learn more about it and Sign-Up today!